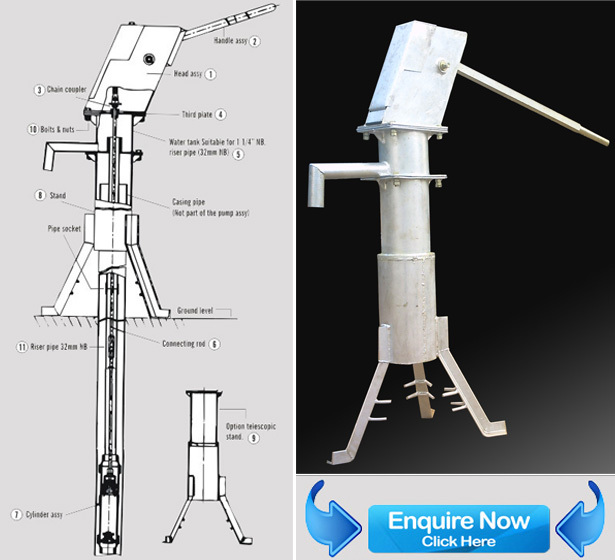 The standard deep well hand pump suitable for lifting water from deep set bore holes covering static water level (SWL) ranging from 20 mtr to 40 mtrs. The pump is suitable for installation on bore well/casing size minimum dia 100 mm nominal bore size. However with a telescopic stand assembly in place of normal stand, the same pump can be installed on a 150 mm nominal bore well size .However it is left to customer’s specific choice as well. 3. Chain with coupler assembly.